Enough for two! A quarter chicken, a half slab of ribs, pulled pork, beef brisket, two sides, two pieces of cornbread, and Texas toast. Beef brisket, pulled pork, sausage, turkey, two sides, and Texas toast. 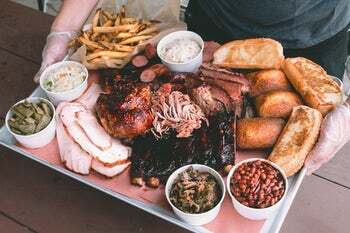 Enough for two adults and two kids: a pound of your choice of smoked meats, buns, two pint-sized sides, and cornbread. 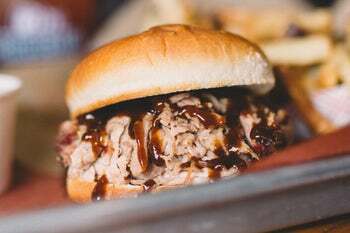 Pick two: pulled pork, brisket, pulled chicken, turkey, sausage, quarter chicken, three ribs. 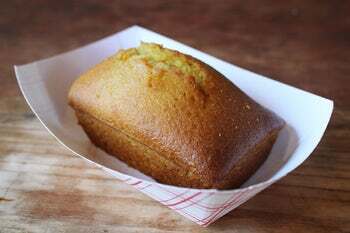 Served with Texas toast. Enough for six! Brisket, pulled pork, turkey, a half slab of ribs, a half chicken, two sausages, six sides, cornbread, and Texas toast. 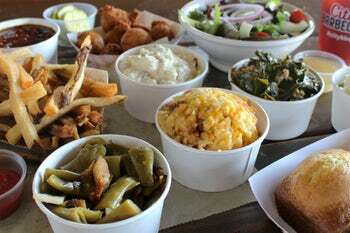 Choose your three favorite scratch-made sides. 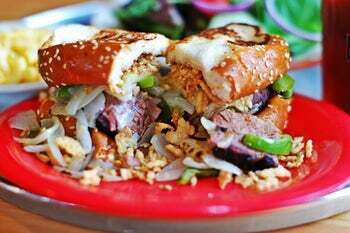 Award-winning beef brisket, provolone, peppers, onions, and horseradish sauce, all piled high on Texas toast. 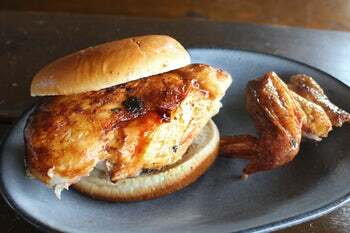 All-natural chicken breast, filleted by hand and served on a bun (with the wing on the side). Pulled pork marinated in vinegary Swine Wine and topped with creamy slaw. Hand-rubbed smoked over local hickory wood and pulled to order. Hormone-free turkey breast rubbed with salt and pepper and smoked to perfection. Smoked chicken, pulled from the bone and mixed with scratch-made 'Bama sauce. 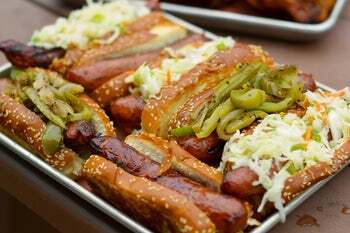 Texas-style smoked beef sausage in a natural pork casing served on Texas toast with vinegar slaw. Pulled pork, vinegary Swine Wine, and creamy slaw, all in a smaller serving. 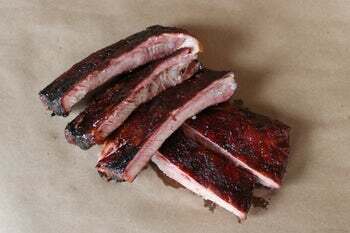 Still smoked for up to 18 hours and carved to order, just a smaller portion. A smaller serving of our hormone-free smoked turkey breast. A smaller serving of our pulled smoked chicken in white barbeque sauce. A real labor of love: St. Louis–cut, hand-rubbed, painted with our own barbeque sauce and served with Texas toast. Hand-rubbed, hand-sauced, and cut by the bone (by hand). Hickory-smoked, all-natural, free-roaming, locally raised smoked chicken, served with Texas toast. A hickory-smoked quarter chicken—just the dark meat—served with Texas toast. 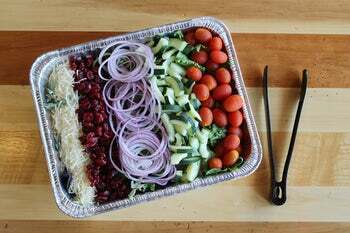 Spring mix, cucumbers, tomatoes, cheese, onions & cranberries. 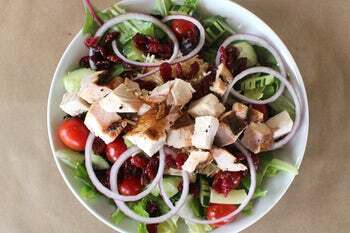 Smoked turkey, spring mix, romaine, grape tomatoes, red onions, cucumbers, dried cranberries, and Parmigiano-Reggiano cheese. 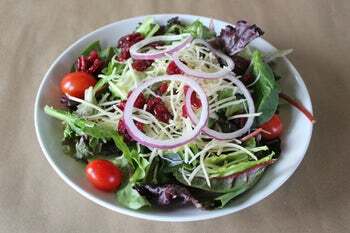 Enough spring mix, cucumbers, tomatoes, cheese, onions, and cranberries for 10–12 folks. 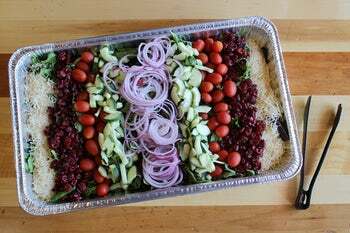 Feeds 20–24 folks: spring mix, cucumbers, tomatoes, cheese, onions, and cranberries. 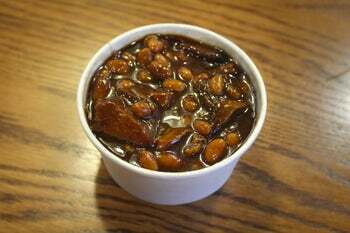 Our founder's recipe: beans, our Sweet City sauce, and our award-winning brisket. 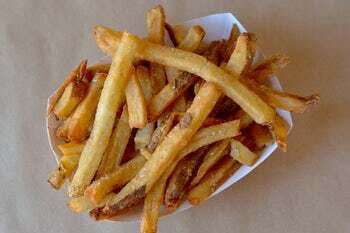 Fresh potatoes cut by hand, salted with sea salt, and made fresh right when you get here (please allow three minutes). 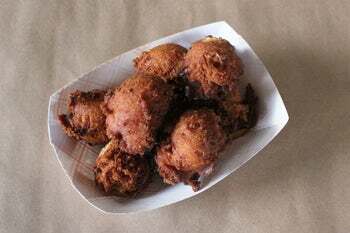 Hand-battered and made fresh right when you get here (please allow three minutes). Crispy on the outside, soft on the inside, and hand-dipped fresh, right when you get here (please allow three minutes). 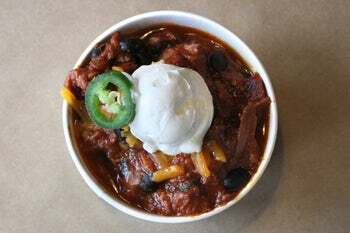 Brisket, green chilies, jalapeños, and black beans, served with cheese, sour cream, and sliced jalapeños. 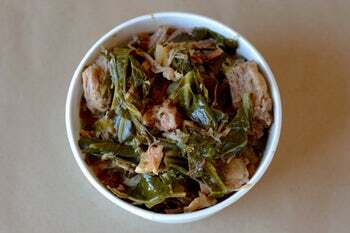 Fresh collard greens, pulled pork and bacon, vinegar and a dash of hot sauce. Scratch-made and baked fresh (if you're looking for a baker's dozen, check out Party Packs). 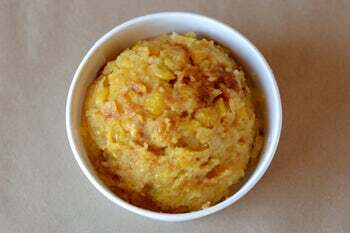 Homemade every day from whole kernel sweet corn, butter, sour cream, and cornmeal. 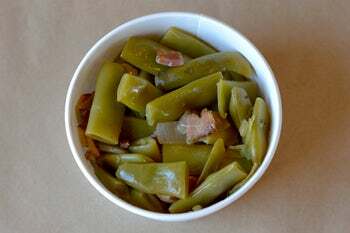 Kentucky Wonder beans, onions, smoked bacon and cracked black pepper. Cavatappi in a creamy, rich, super cheesy sauce. 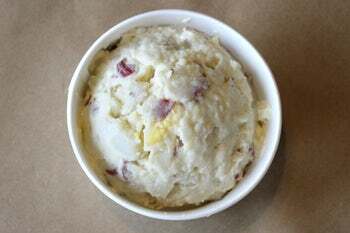 Redskin potatoes, eggs, onions, and celery in a mayo and mustard dressing. 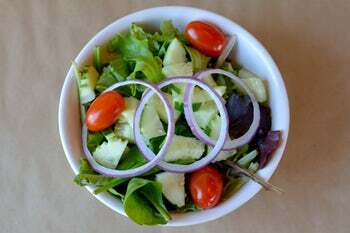 Fresh romaine-and-spring mix, grape tomatoes, cucumbers, red onion, and handmade dressing. 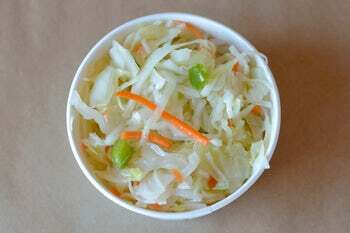 Slightly sweet and super refreshing, full of coarse-cut cabbage, chopped onions, and green peppers. 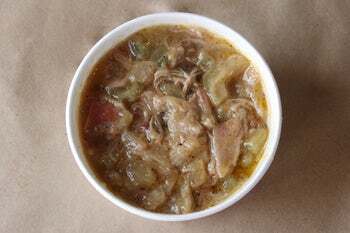 pulled pork marinated in vinegary Swine Wine and topped with creamy slaw served with one kids’ side and drink. 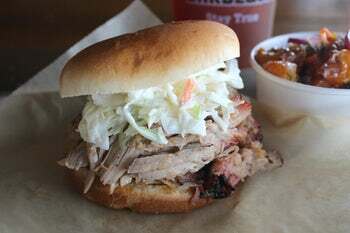 Hand-rubbed smoked over local hickory wood and pulled to order, served with one kids-sized side and drink. Smoked for up to 18 hours and always carved to order, served with one kids-sized side and drink. Hormone-free turkey breast, rubbed with salt and pepper, smoked to perfection, and served with one kids-sized side and drink. Smoked chicken, pulled from the bone, mixed with scratch-made 'Bama sauce, and served with one kids-sized side and drink. Texas-style smoked beef sausage in a natural pork casing served on Texas toast with one kids-sized side and drink. One locally raised, hickory-smoked chicken leg, served with one kids-sized side and drink. Chicken tenders marinated in buttermilk, hand-battered, fried to order, and served with one kids-sized side and drink. 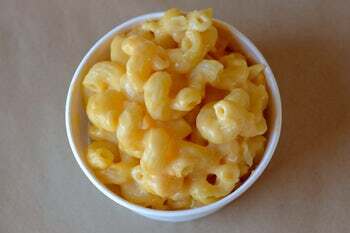 Creamy, curly, picky-eater-pleasing mac & cheese, served with one kids-sized side and drink. 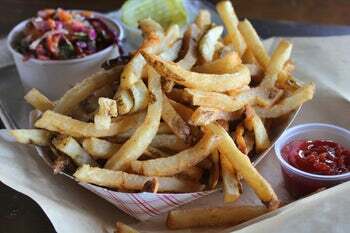 Marinated in a bit of buttermilk, spiced with our signature dry rub, hand-battered, and fried to order. Fresh bananas, vanilla wafers, and classic creamy pudding with hand-whipped cream and a toasted ‘nilla wafer crumble. 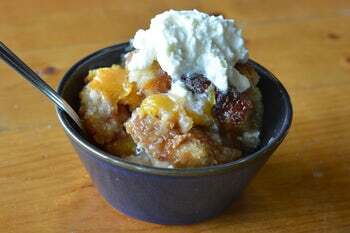 A ton of peaches in a gooey, caramelized crust, served with hand-whipped cream. 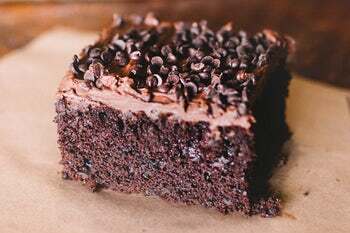 Homemade chocolate cake topped with chocolate frosting and chocolate chips. Just the right level of sweet, brewed fresh in-house. Refreshing iced tea brewed in-house. 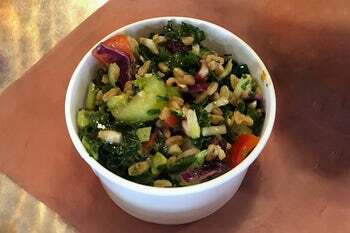 Freshly made and perfectly balanced. Pepsi products, pick your fave.